Pune-based WorkApps Solutions Pvt. Ltd, which offers an enterprise workplace collaboration tool, has introduced an update to integrate its app within the Google Maps application programming interface (API). The update will help organisations manage large and distributed field teams more efficiently, WorkApps said in a statement. An API is the basic building block of an application that is kept open to other developers for integration of other applications and platforms. The startup said that the update has three major features—GPS tracker, moving maps and memo. The GPS tracker helps in identifying the exact location of a sales or service personnel on the field, making it easier to pass customer leads and service requests. The moving maps feature allows for viewing the location of all field personnel on a live map. This then shows the real-time distance between a customer and any on-field resource, allowing the closest person to be connected to the customer. The memo feature is a simple service through which a message can be broadcasted to a selected set of employees or to the entire workforce in an organisation. "People were looking for a secure and efficient way to communicate with co-workers, clients and partners," MVS Murthy, co-founder and COO of WorkApps, said in the statement. 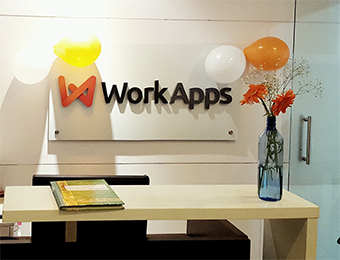 WorkApps was founded in 2015 by Murthy, Rudrajeet Desai and Shankar Borate. Murthy earlier worked with ICICI Bank, Edelweiss and Tata AIG. Desai is a first-generation entrepreneur in the consumer Internet and mobile industry. Borate has worked with Adobe, Symantec, Intuit, Siemens and GE. The WorkApps application suite offers a host of features for enterprise collaboration and project management. This includes task management, team discussions, project collaboration, creating reports and analysis, file management, activity notifications and maintaining the company directory. The app can also enable automation of travel claims, employee attendance, enhanced security features for women employees and giving an official communication channel to staff who are off the payroll. WorkApps counts HDFC Ltd, Edelweiss, Piramal Healthcare, UTI Mutual Funds and Future Group among its customers, according to its website. In July last year, the startup raised $1 million from seed-stage investment firm SRI Capital.